@sammy It has 12 stops, but distributed rather differently from most other cameras. More stops in the highlights than in the shadows, which makes for a more film-like response :) Highlights blow out beautifully. Two and a half years later and I thought I'd reopen this discussion.... because have you seen on eBay lately just how cheap they're going? :-o You can pick up a Sony F3 for similar pricing to a new BMCC. 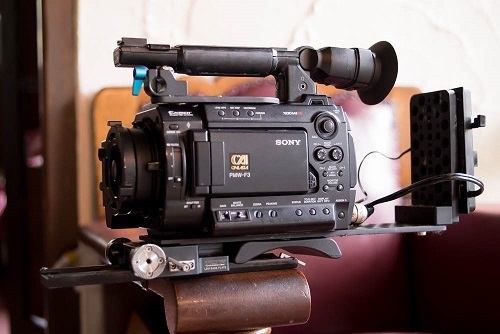 Does a Sony F3 still make sense to people in 2015? For the only extra grand or so over the cost of an AF100 or FS100 it would seem like an F3 is worth it if you're looking for an older large sensor camcorder on the ultra cheap. One problem will be to sell it later. If you need only FullHD and have lots of manual lenses it can work. When it is only US$1.7k I probably don't need to worry as much about resale price as a person who purchased it new at US$16k. And yes, got a set of Rokinon Cine DS lenses to use with it. <<The biggest problem i have is deciding between the two cameras. The RED is simply razor sharp, has a punchy slick look, and has the easiest onset ergonomics and workflow. The footage is 16bit 4K RAW. I mean, the camera is the size of a Hassleblad and gives you amazing images. The F3 on the other hand, is night vision, which makes for simpler indie shooting on lower budgets where you dont have access to bigger units. It also has more useable dynamic rage, and its color is in my opinion the best in digital right now short of the Alexa. ( Though REDColor3 is REALLLLLY good!) Case in point, in the skin tone test you just watched, the color of the wall in the F3 footage is completely accurate. Thats exactly what my wall looks like, but looks quite magenta in the RED footage. If I fight the magenta with a bit of green, the skin tone gets thrown out of whack. This green/magenta balancing act is a definite pitfall of the RED, even with REDColor3. An F3 for $1.7k. That's a steal. I'd pick that up in a heart beat. He changed the price and now wants US$2.1k for it :-( Which for my poor limited budget now seems just a little bit too much? I'm almost completed my initial kit out for now. The last remaining items I still need to decide on buying is: a second dovetail (one for the tripod, one for the monopod. The camera already came with one dovetail), a fluid head for the monopod that can handle 10kg or more, and maybe a tripod (as I expect my current one won't quite handle the full set up). Is there more than one standard for these dovetails??? :-/ I had guessed there was only the Arri standard dovetail. I've attached an image of my camera, with its baseplate and dovetail that it came with (TILTA LSW baseplate). I can't seem to find online the specific "TILTA LSW Baseplate" which I own (that is the words on the side of it). Guessing it is a bit older model which is not being sold anywhere. As far as I can tell by looking over Tilta's current products they make two kinds of dovetails: Arri standard and Sony VCT-U14. Unless... is "Lightweight Standard" a third standard for dovetails? I'm unfortunately suspecting it is! Is Tilta with their 15mm baseplates using their own made up "standard"? ?